When the influx of new residents started flocking the Charlotte region in the early 2000's, Union County was one of the first counties to see explosive growth and that has not slowed down over the years. It remains one of the fastest growing counties in North Carolina. It is conveniently located south of Charlotte and widening of main roads as well as the completion of the I-485 beltway have shortened commute times to the Ballantyne, SouthPark and Uptown areas as well as to the Charlotte Douglas International Airport which is about a 30-45 minute drive depending on traffic. In addition, the Charlotte-Monroe Executive Airport in Monroe is just 35 minutes south of Uptown Charlotte. While tax rates have risen slightly over the years to accommodate the building of new schools, improvements of infrastructures, and the expansion of police and fire departments, residents and business owners continue to enjoy a high quality of life complete with all the conveniences of big city living just minutes away. One of the nicest surprises to newcomers are the quaint, pedestrian friendly downtown areas in many of the towns and the way residents cherish their very own small town America with parades, farmers markets, smaller outdoor concerts, special community events throughout the year, and even listening to comforting rumble of the CSX trains that pass through many of its towns throughout the day and evening hours. In addition, there is a tremendous selection of housing options throughout the county and in all price ranges and a highly rated school system. There are over 201,000 residents in Union County which is comprised of 14 townsâ€¦ each with a distinct personality and character. They include: Fairview, Hemby Bridge, Indian Trail, Lake Park, Marshville, Marvin, Mineral Springs, Monroe, Stallings, Unionville, Waxhaw, Weddington, Wesley Chapel and Wingate. The towns with the steady growth in terms of new housing developments, schools and shopping centers are in the northwestern section of the county closest to Charlotte which includes Weddington, Marvin, Wesley Chapel and Waxhaw while the eastern side of the county remains more rural. 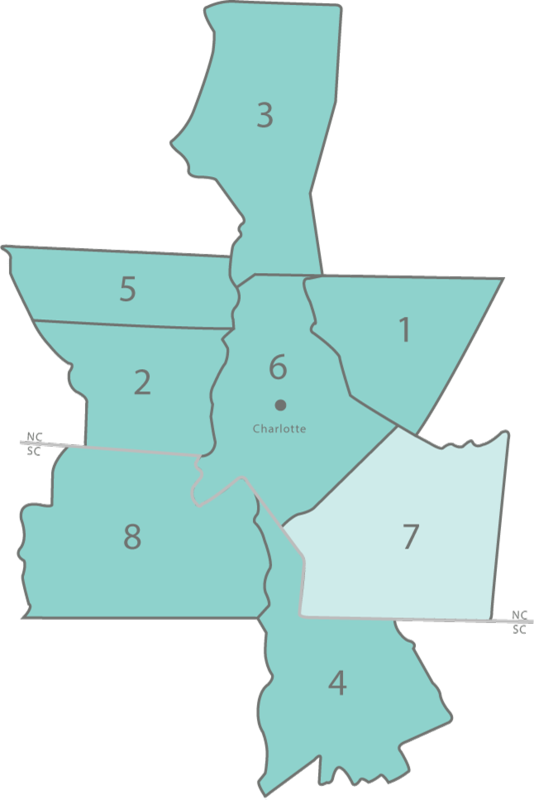 Indian Trail borders Charlotte and has the highest population with over 33,000 residents which has surpassed the population of the Monroe, the county seat. Union County offers many recreational opportunities for outdoor enthusiasts such as hunting, fishing, boating, swimming, and hiking. While many of the towns own and manage their own parks, Union County Parks and Recreation owns and operates three parks including Waxhaw's Cane Creek Park which is home to one of three North Carolina trophy bass lakes; Fred Kirby Park in Lake Park, and the Jesse Helms Park in Monroe. Each offers a wide variety of activities with something for everyone to enjoy. Waxhaw is also part of the Carolina Thread Trail, a 15-county regional network of 200 miles of trails. In addition, golfers can choose from many beautiful public and private golf courses and there are numerous sports complexes, swim and tennis facilities, and ballparks throughout the county. The town of Waxhaw hosts events regularly downtown and is known for its annual 4th of July and Christmas parades as well as antique shops, art galleries, metal, pottery and glass studios, the Museum of the Waxhaws, and the Alphabet Museum at JAARS. Mineral Springs is home to the annual spring event of the Queens Cup Steeplechase, of one steeplechase horse racing's major events. Marshville is host to its annual Boll Weevil Festival, an annual street fair and carnival each fall. The other towns also hold many special community events throughout the year. If you choose to move to Union County, chances are you will find many residents are from out of state and are more than proud to call this quaint county their new home.